This was a book I have been waiting years for yet when the time was approaching for its release I didn’t want to read. Sometimes you become so attached to a series that when the end is in sight you really don’t want to read because you know it will be the last and that is exactly how I felt when I picked up this book. This series was also a first for me, this was my first paranormal read ever. It was a genre I had body swerved at every opportunity yet an author I trusted said you must read it and from that point on my love of everything Amy Bartol was born. I fell in love with her writing voice, the vivid descriptions, these worlds, languages and characters that are all borne from Amy Bartol’s imagination. A world that she creates with flair and becomes so real you cannot help but envelope yourself in these characters lives and battles. This is one series that I would love to see on the big screen, I can picture it now, it would be totally EPIC! So…this is the end…this was an extremely bittersweet read and I savoured every word. I read the slowest I have ever read so I didn’t miss a thing. I received so many answers and they were all delivered with clarity and acceptance. We finally get to really understand the connections between the characters, especially Evie and Reed, Xavier, Russell and Brennus. Each character has a pivotal role in Evie’s development and her cause and I expected nothing less. 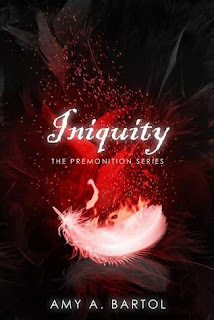 Every person had their part to play and in this epic culmination of this series Amy Bartol explained everything in depth and with at times heart wrenching clarity. No matter what team you were on I feel the end was true to the characters that we have become to love throughout this series. I always knew that this series was going to end up in the mother of all battles and I wasn’t disappointed. Sheol and Heaven come to blows in one of the most descriptive and visceral scenes I have ever come across in words. I could picture it all, I imagined it all and I definitely felt it all. Yes, I cried, but as you know I am a soft sap but again that is testament to Amy Bartol’s writing, I have such an affinity for these characters that I couldn’t help but live their lives together with their emotional and physical distress. Amy Bartol really brought this series to a magnificent crescendo and this is one series that I will never ever forget and will definitely be re-reading. I am not going to go into anything with regards to plot because that would be criminal. Is there a happy ever after…yes but the last few paragraphs really make you think? Personally I don’t think that this was an attempt to prolong this series at all but was more a shout out to those fans that had supported this particular character throughout the series, it will certainly be a topic for many discussions and probably many an outrage but for me, Evie’s story came full circle and she had finally found her feet and her purpose in life. “No,” Brennus says with eyes softening for a moment. I have to give a shout out to Brennus, while I was never on his “team” I never once doubted his affections and intentions towards Evie but Amy Bartol really brought to life this arrogant, Irish, fallen faerie. His dialect had me crying with laughter at times and his witty one liners really balanced this book with much needed entertainment, I have to say he had some of the best quotes in this book and I have to admit I have an extremely soft spot for him. Reed and Evie together were a formidable force and once again my heart and soul were with this fearless couple. With their band of friends that have always been there for each other this little army were as tight as ever and always had each other’s backs. Russell, Zee, Buns and Brownie all have their parts to play and their solidarity towards one another was great to read especially when the odds are stacked against them. With the past coming back to fight another day this team have a lot of demons to battle but I loved the unity that Amy Bartol brought to this finale. Even those perceived as unredeemable proved themselves when the chips were down and this really wrapped up this fight between good and evil. To say I have loved this series would be an epic understatement and while I am seriously gutted it is over I hope that one day Amy Bartol may bring them to life once again.